All A Bunch Of Momsense: Behind. Again. Seriously. I finally responded to Monday's Beth Moore study questions, on Thursday, I believe. Got my 5 Question FRIDAY post up late on Saturday. It's easy - click the button for da rulez, courtesy of our hostess, Julia @ Work, Wife, Mom... Life! I skipped, hopped and jumped my way around, and ended up an hour up the road. Literally. I did not take an hour to get to her, because I tried to be fairly focused on my end goal. And the sixth degree landed me at EmcogNEATO! I don't even want to try to describe her. I've read pages and pages of her blog. I've read about her ex-husband finding her blog, I've read about jury duty, I've read about her opening back up to love, and I have read about banana muffins. Emily writes with a clear voice from the randomness of the everyday and the reality of life. Today, she's turning the blog over to Ian from The Daily Dose of Reality who has presented us with "Man Questions" - without further ado, today's getting to know you! 1 - Why did you start blogging? My first blog was one I edited, primarily. I co-wrote a college football blog with my "Big Brother" and was only invited to do that when he sent me the link, and I sent him a list of edits. 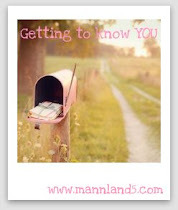 From there, journaling, sharing, documenting, it just was a natural fit for me. I read a number of blogs before I wrote much, and just got sucked in! 2 - Who's the one blog friend that you would want to meet most in "real life"? I have "met" some amazing people online. To select only one to meet is simply unreasonable. 3 - Why are you always concerned with losing that "extra 10 pounds" when chances are your husband/boyfriend/friends tell you that you look just fine the way you are? I'm not. I have never been concerned with weight loss, actually. 4 - What's the one thing you wish guys could understand about you? I tend to be "one of the guys" and sometimes, when I am having a "girl" day, I need 'em to shut up and cope. 5 - Tattoos. How many do you have and how many are visible when you wear your "everyday" clothes? I have three, I love them, and I want more. I have always been careful to place them where they only are shared when I choose for them to be. The one on my right shoulder is most often visible, since it's apparent when I have on a tank top or similar item. 6 - What was the best year of your life and why? I have had many great years, and hope that the best one is yet to come. That being said, I'm going to go with 2008. We had some fantastic fun that summer, and the family time was just incredible, plus, hello Hawai'i & fun with hubby and BFF! 7 - Name three things you would do if you were a man for one day. Pee somewhere random 'cause I could. Buy all the tools I want without having to worry that some guy is going to try to talk me in to this "great 145 piece set" that includes 96 Allen wrenches. (Who NEEDS 96 Allen wrenches!?) Eat all the food I want to without being stared at. 8 - What's your alcoholic drink of choice that usually raises a few eyebrows? I don't usually end up with to many drinks that are "eyebrow raisers" but I can shoot whiskey like nobodies business. And I do periodically. And for those not in my "circle" it can come as a bit of a shock. Ok, I think I'm up to speed, at least for the moment. It's officially getting to crunch time at work, so keep hanging with me, we're almost there! First off thanks for the giveaway shout out..Second..that is one suhweet mug..
and how fun would it be to just whip "it" out and pee on a tree or something..super fun!! Ooooh, shootin' whiskey?! Sounds like fun - that would be fun to see! Just stopping by to say hey! Great answers!! Stopping over from MannLand5! I love all your answers, so fun!!! Thanks for sharing! Hope you have a great day! I selected one blogger in perticular - but later I was like - Hey I really like everyone that I meet. Oh I would absolutely eat all that I wanted too!